Tissue Paper in the same family of blue (sky blue, light turquoise, and royal blue) Tissue Paper works best. 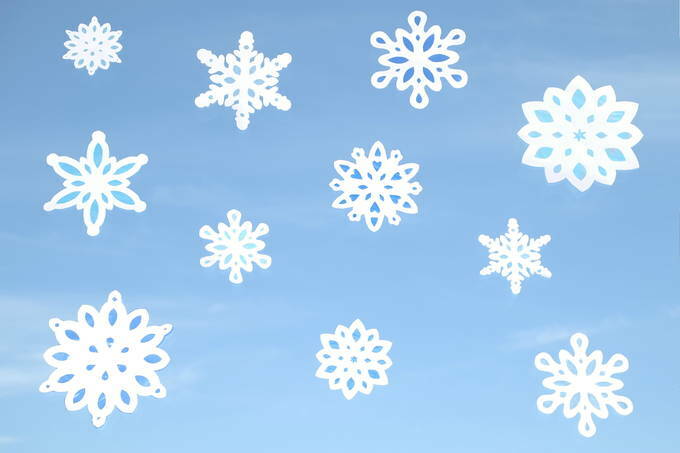 Print the snowflake patterns (below) – that you would like to use. They range from 3 to 6 inches wide. So you may want to enlarge them. 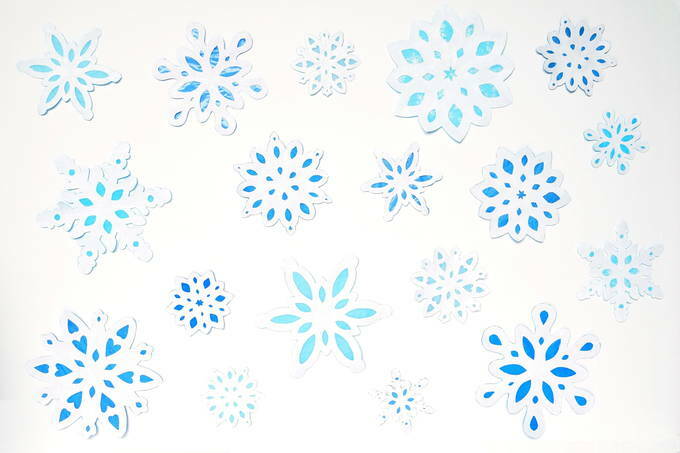 There are 30 snowflakes to choose from – 5 different sizes for each of the six styles. Check the size of your window area. Our window area was 2½ x 5½ feet. Choose the sizes and styles of patterns that best suit the look you want for your window size. Fold and cut out the snowflakes using my directions (below). Adults should cut the two smallest sizes. With your iron on low heat, iron the snowflakes flat. Iron the tissue paper sheets flat. You need to make square stencils to help cut the tissue paper. So, print an additional 5 Folded Snowflake Pattern and cut out just the five squares. Put the stencil under the tissue to cut the squares. Separate the tissue paper into dark, medium, and light groups. Cut an equal amount from each color group. (Since I had 30 snowflakes, I cut 6 of each size). When you cut, try to center your square in the flattest places on the tissue paper – to keep folded lines to the sides. Lay the tissue paper squares out to see where you want what sizes and colors. Then lay the snowflakes on the tissue squares as you would like them in the window. Use the square stencils to cut parchment paper into squares. Use a glue stick to apply glue to the back side of the snowflake. Press it onto the tissue paper. Cover it with the parchment paper square that fits its size. Press it down from the center outward. Leave the parchment on the snowflake and lay a heavy book on top so it will dry flat. Let them dry for several hours. 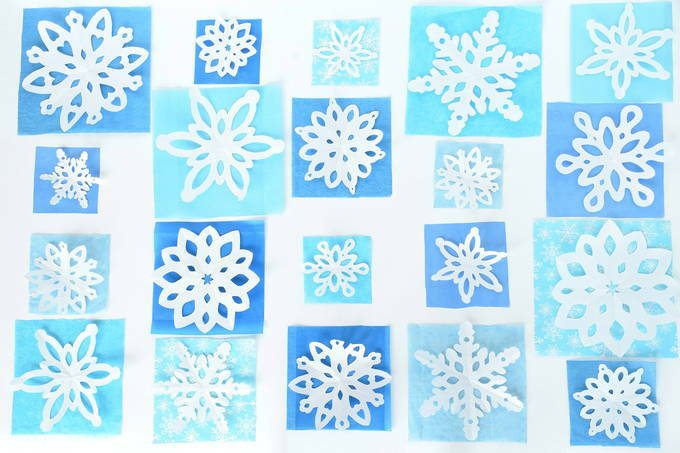 Then cut the snowflake outlines from the tissue paper. Leave them under the books again overnight. It’s important that they dry flat or they may curl. Lay one snowflake with the pattern side down on the parchment paper. Use a glue stick to apply glue to the front of the snowflake. Move the snowflake to a paper plate. Sprinkle it with glitter (I used “crystal” glitter). Shake off the excess. Put the parchment paper and book on again to keep it flat. Let it dry completely. Repeat with all of the snowflakes. Arrange the snowflakes on a table as you would like them to be in the window. Attach the back of the snowflake to the window with small pieces of clear tape. Be sure to tape down any tips that have curled up.